Since I am a living history volunteer at Fort Larned National Historic Site where I portray a cavalry chief trumpeter, I decided to research Bugler Clarke to see if he had any connection with Fort Larned. Thanks to Ancestry.com I found the U.S. Army register which contains his enlistment information. It shows that Charles Clarke enlisted at Carlisle, Pennsylvania on November 27, 1866. He was sworn in by Lieutenant Irwin for a period of five years. From there he was sent as a recruit to Fort Riley, KS. The record further shows Clarke was from Troy, NY, was 24 years old, with hazel eyes, light hair, fair complexion, and 5 feet 1 and ½ inches tall. His occupation was cigar maker. A review of microfilm containing the 7th Cavalry’s Muster Rolls and other reports from December 1866 through June 1867 reveals that Clarke, while at Fort Riley on December 23, 1867, was assigned to Company G 7th Cavalry which he joined at Fort Harker on 27 December. While at Fort Harker Company G built stables and in February accompanied Custer in pursuit of Indians after their villages were abandoned. Also in February Clarke and Botzer were designated as buglers. 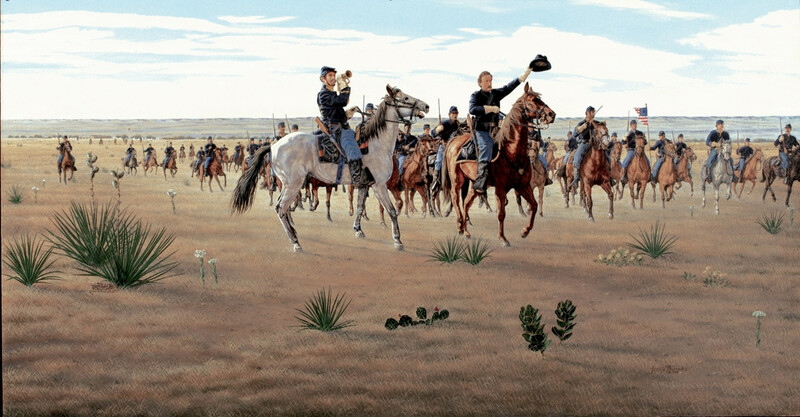 Company G accompanied the 7th Cavalry as part of Hancock’s Expedition, was at Fort Larned 8-12 April, and was with the 7th when it pursued the Indians after their abandoned village on the Pawnee Fork was burned by Hancock. From late April to midJune Company G was camped at Big Creek near Fort Hays. While there, its soldiers conducted several forays against hostile Indians along the Smoky Hill Trail stage route. However, much of the time was spent in restoring the physical condition of the horses. During this time, Captain Barnitz wrote that General Custer, on 17 May, ordered the Officer of the Day to have the heads of six men shaved to the scalp on one side and then paraded through camp as punishment for leaving camp without permission to go a half mile to purchase canned fruit because of their poor diet from Army rations. Clarke was ordered to be the barber. Thus ends the information I was able to find on Charles Clarke. However, because he was designated a bugler, and the chief bugler of Captain Barnitz, leads me to believe he served in the cavalry during the Civil War. How else would he have known and been able to play the multitude of cavalry and garrison bugle calls. I was not able to find the answer, nor was a close friend who does such research. Clarke may have enlisted under a different name is my guess. Charles Clarke was initially buried in the Fort Wallace Military Cemetery, and later disinterred and reburied in the Fort Leavenworth Military Cemetery, along with the other cavalrymen killed with him. Interestingly, his last name is spelled Clark on his headstone as it is on a typed list of soldiers buried in the Fort Wallace Military Cemetery. However, in the Register of Enlistments, Record Book of Internments, other military reports, Barnitz’s journal and letters, and Ancestry.com, it is spelled Clarke. My next “bucket list” item is to get his headstone corrected. 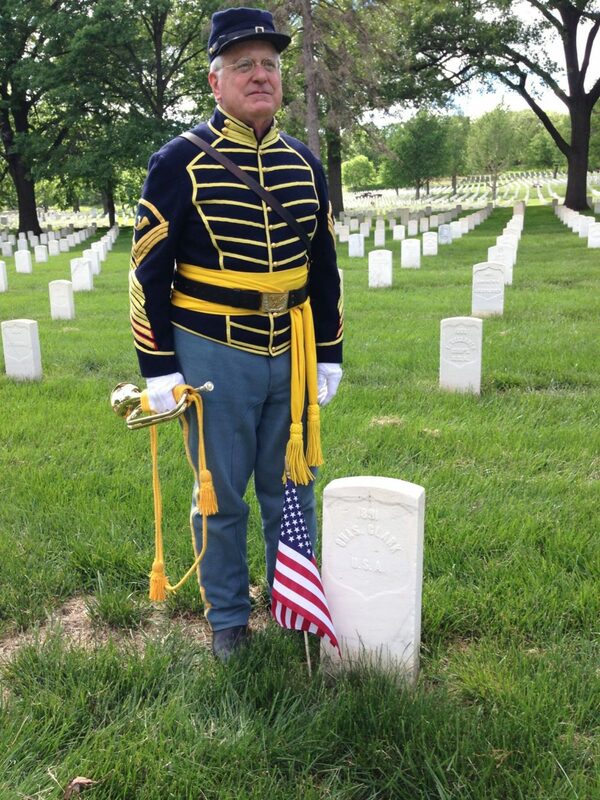 The photo below shows me at Bugler Clarke’s gravesite at the Fort Leavenworth National Cemetery. I had just played Taps in honor of him. Sam Young is a retired US Army Colonel and does living history as a Cavalry Chief Trumpeter at Fort Larned National Historic Site. He isÂ the editor of the U.S. Cavalry Association’s The Cavalry Journal. This entry was posted on Friday, March 24th, 2017 at 2:06 am	and is filed under Bugle Stories, Buglers Through History, General Interest, History of Taps, History of the Bugle. You can follow any responses to this entry through the RSS 2.0 feed. You can leave a response, or trackback from your own site.